Oh the Holidays are here, magic starts to fill the air so i made us the loveliest, creamy, dreamy greek yogurt potato salad, and a chia pudding with Chobani® Non-Fat Plain Greek Yogurt ! 5 ingredients and so easy a kid could do it. 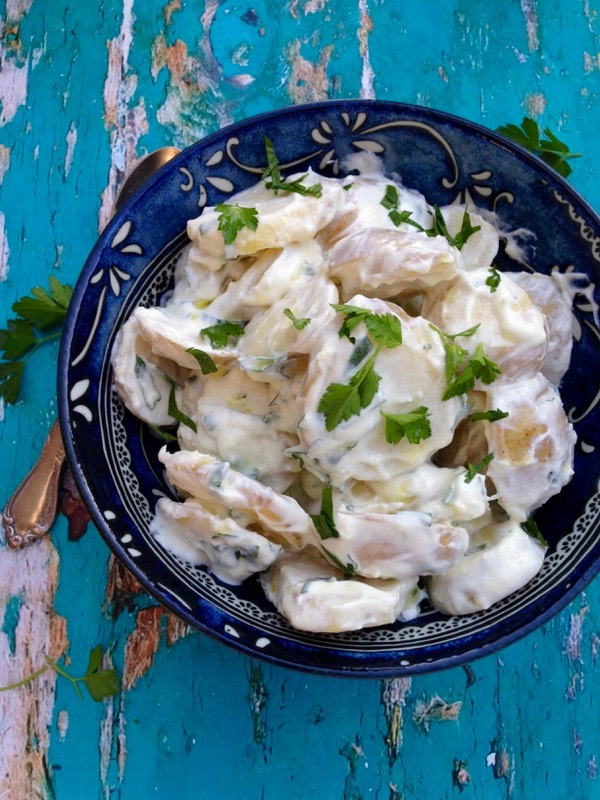 I had so many ideas flying through my head, because really the culinary opportunities are endless, and decided on this greek yogurt potato salad I make often when I have guests, because it is so quick and easy and a crowd favorite. Then I use the leftover greek yogurt together with my favorite blood orange cranberry sauce I always have around during the holidays, to make an instant chia pudding for breakfast or dessert. 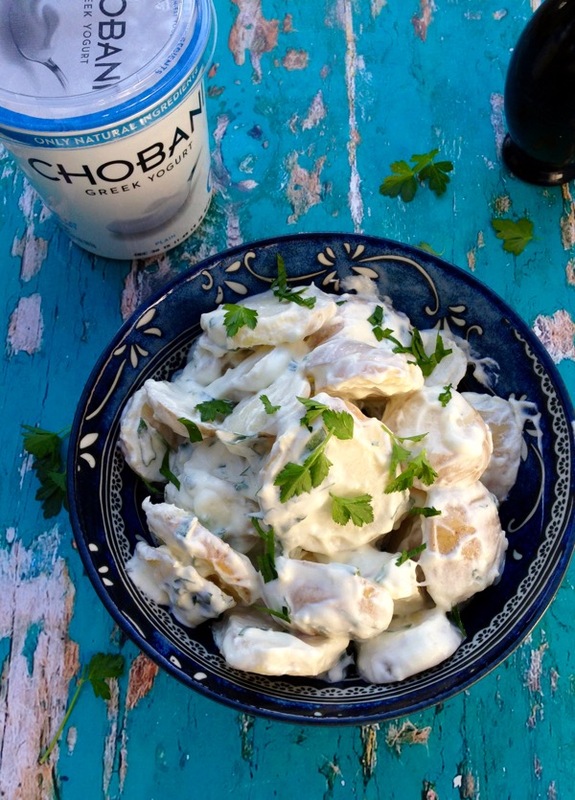 High in protein and low in fat but with a creamy texture, and 40% less sugar than regular yogurt, the Non-Fat Chobani® greek yogurt is the perfect alternative to mayo and the perfect ingredient in my quick potato salad. There are no artificial flavors, only natural not genetically modified ingredients. It is as simple as 1,2, 3. All you need to do is mix together some ingredients you most likely have on hand, boil some golden potatoes and dress them in the creamy velvety smooth Chobani® yogurt dressing. 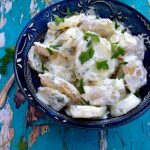 This is a protein packed potato salad that makes the perfect side dish to pretty much any meat or chicken dishes you have on your holiday table. Same goes for the chia pudding, you really don’t even need a recipe for that one. All you need to do is transfer the yogurt to a bowl, stir in the chia seeds and some vanilla extract, spoon over the cranberry sauce and sprinkle with dark chocolate chunks. Garnish with fresh basil or edible flowers, and if you have it but totally optional, a few grains of bee pollen, or walnuts, whatever is available in your pantry this time of the year. Now you see why I always look for the big 32 oz yogurt container, I make dinner and dessert with one awesome ingredient. Thankfully Walmart saved the day and had a few on the lower shelf in the refrigerator isle. Trust me, it is there, go grab some ! I’m going to make some cranberry smoothies next, and who knows what other Chobani® recipes ideas I’ll dream of tonight. Wash and scrub the potatoes well and slice them into 1/3 inch slices. Add the potato slices to a stock pot and cover with cold water. Bring to a simmer and season generously with sea salt, about 3 tablespoons. Simmer the potatoes for about 10 minutes until al dente. You don’t want them to fall apart. Drain them in a colander and allow them to dry in their own steam for a few minutes. Meanwhile in a large mixing bowl combine the Chobani® yogurt, garlic, olive and parsley until combined. Reserve some of the parsley for garnish. Add the cooked potato slices to the Chobani® dressing and gently toss to coat well. Adjust seasonings to your taste with more sea salt and black pepper. Transfer to your favorite serving dish and garnish with the remaining parsley, a drizzle of olive oil and the lemon zest. P.S. this Purple Potato Salad Insanity ! Thanks Cathy, this was a total hit in out house, will surely have this recipe on repeat ! Yum! 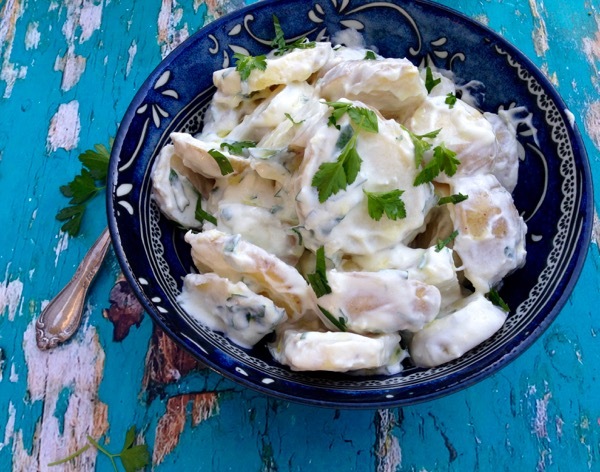 I love creamy potato salad, what a great idea using Greek yogurt! Greek yogurt is officially a thing in my kitchen ! Put it on everything ! I love how much healthier this is using yogurt rather than mayonnaise. Me too ! Such a winner with everyone ! We are huge fans of Chobani Greek yogurt and are always looking for new ways to use it. 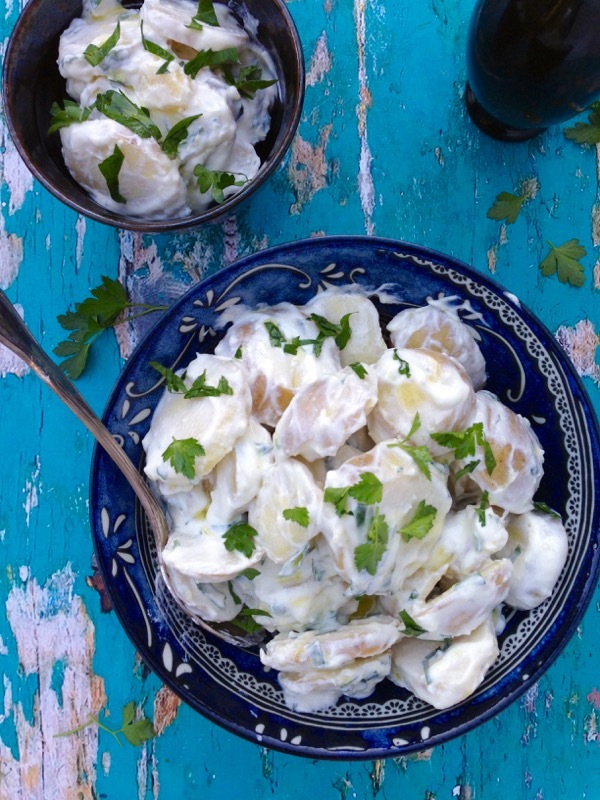 Your idea with this potato salad is so delicious and so obvious, I can’t imagine why we haven’t thought of this before! Fantastic recipe here and we appreciate you sharing it!! I agree, it has a unique taste and creaminess that works magic in a recipe. love yogurt & potatoes. 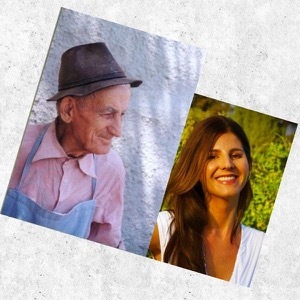 greek yogurt looks like such an upgrade! So creamy, it feels decadent and rich and special. I love Chobani yogurt and always have some in my fridge. Your potato salad looks delish!!! Me too, so versatile, saves the day for sure ! 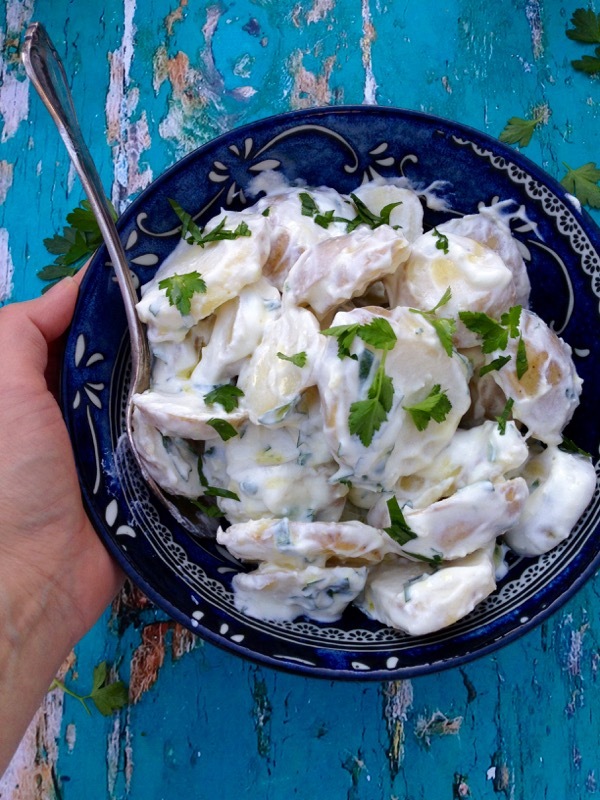 I love potato salad but i have never thought of making it with Greek yogurt. What a great idea, looks delicious! This looks so delicious and creamy. I love that this is healthier that it’s mayo counterpart! Absolutely Rachel, I can’t really do mayo dressing on potatoes, and If I ever do, I make it myself with olive oil and thin it out with lemon juice. But now greek yogurt dressing is the thing around here hehe.